Here is an outrageous thought: All the matter around you is made of atoms, and all atoms are made of only three types of subatomic particle, protons, electrons, and neutrons. Furthermore, all protons are exactly the same, all neutrons are exactly the same, and all electrons are exactly the same. Protons and neutrons have almost exactly the same mass. Electrons have a mass that is about 1/1835 the mass of a proton. Electrons have a unit negative charge. Protons each have a positive charge. These charges are genuine electrical charges. Neutrons do not have any charge. Even more outrageous is the shape of the atoms with the three subatomic particles. The neutrons and protons are in the center of the atom in a nucleus. The electrons are outside the nucleus in electron shells that are in different shapes at different distances from the nucleus. The atom is mostly empty space. Ernest Rutherford shot subatomic particles at a very thin piece of gold. Most of the particles went straight through the gold. It was like shooting a rifle into a thin line of trees. Some of the particles bounced off, some stuck inside, but the major portion of them passed through the gold foil. By Rutherford's calculations, the nucleus in an atom is like a BB in a boxcar. That is a genuinely outrageous idea. Almost all the mass of an atom is concentrated in the tiny nucleus. The mass of a proton or neutron is 1.66 E -24 grams or one AMU, atomic mass unit. The mass of an electron is 9.05 E -28 grams. This number is a billionth of a billionth of a billionth of a gram. It is not possible for anyone or any machine that uses light to actually see a proton using visible light. The wavelength of light is too large to be able to detect anything that small. 2. Definite Composition: No matter the origin, a particular compound is made up of the same matter/elements in identical fractions. 3. Multiple Proportions: When one or more elements are combined together to form a compound, it is always done in the exact same proportion. To understand the nature of the atom, one must return to the beginning and analyze observations which lead to our modern day schema. 19th century scientists began their odyssey into understanding the atom by observing electricity. The notion of matter and electric charge were understood but the actual components of the current were an anathema. First among many experiments are the Cathode Ray Tube Experiments. These cathode rays originate at a negative cathode and proceed towards a positive cathode. However, once the scientists introduced a magnet to the setting, they noticed these rays did not travel in straight lines. Rather, the rays were attracted towards the positive magnet, making them appear bent. Scientists understood that opposites attract and the current, which bent toward the positive end, must be composed of negatively charged "things" (we later call them electrons). Discovery: From electrons to a nucleus! After the discovery of the electron, physicists J.J. Thompson and Robert Milliken proceeded to illustrate the charge (-1.602x10-19 C) and mass (9.109x10-28g) of electrons as well. Following their observations, Thompson introduced the "Plum Pudding" model as shown below where the atom is just a positive sphere with negatively charged particles residing inside. Scientist intuitively understand nature demands equilibrium, and that if an atom contains negative portions (electrons) it also must consist of positively charge parts to provide balance. Furthermore, if electrons are exceedingly small, what makes up the mass of the atom itself? Enter Ernest Rutherford, and his Gold Foil Experiments. Approaching the end of the 20th century, Rutherford utilized alpha particles (a.k.a. helium) and beamed them at a thin sheet of gold foil. He noticed that rather than all atoms going through the foil, some began to rebound. The rebounding nature of these few alpha atoms implied that perhaps the negatively charged portions were not part of the nucleus itself and that the center contained a positive portion with substantial mass. Electrons, being so very small, could not have reflected the bulky alpha particles thus there must a large portion in the center having substantial mass with electrons revolving around this center. Rutherford is the first person to coin the term "nucleus" in relation to the atomic center. Following Rutherford, James Chadwick in 1932 discovered the presence of an uncharged portion of the nucleus called the neutron. These developments led to the modern day structure of the atom. 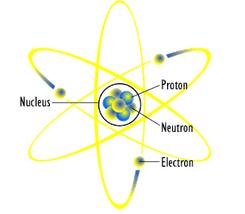 Namely, a nucleus containing protons/neutrons representing the bulk of the atoms mass with electrons orbiting around the center is the modern day representation of the atom. Today’s atom is a spherical existence formulated from a positively charged nucleus consisting of protons/neutrons surrounded by one or more negatively charged electrons. These electrons orbit the nucleus and make up the greatest portion of the atom’s volume. However, it is the exceedingly dense center made up of protons and neutrons which contain the bulk of the atom’s mass. Protons have a charge of +1, electrons -1, and neutrons are uncharged but have mass nearly equivalent to that of protons. The neutral state of atoms exists because the charges of protons and electrons cancel each other out. All atoms of a unique element have the same atomic number and each element has a unique atomic number different from other elements. 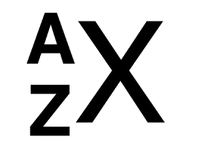 Each atom has a given atomic number (Z), mass number (A), and atomic symbol (X) as shown below. The importance of these numbers cannot be understated and one must understand how to calculate them. I. Carbon: Mass number= 12 BUT Atomic Mass=12.01... why? But wait, where did the notion of atomic mass come from? The atomic mass unit (amu) is based upon the standard of a carbon-12 atom, and states that 1/12 of a carbon-12 atom is one amu. With atomic mass and isotopes affecting the mass of the atom, the next portion deals with the charge of the atom. Ions are atoms of the same number of protons but different number of electrons. In the calculation of an atom’s charge, protons are +1, electrons are -1 and neutrons are neutral. The process of losing an electron makes an atom more positive while gaining an electron makes it more negative. An atom’s charge is indicated in the top right portion of the atomic symbol. The integer that you find in each box of the Periodic Chart is the atomic number. The atomic number is the number of protons in the nucleus of each atom. Notice that there is one and only one integer from 1 - 110 or so in each element box, so we have found all the elements. Each element fits neatly into its niche in the Periodic Table. Another number that you can often find in the box with the symbol of the element is usually not an integer. It is oversimplifying only a little to say that this number is the number of protons plus the average number of neutrons in that element. The number is called the atomic weight or atomic mass. How can it be that an element must have an averaged atomic weight? The number of protons defines the type of element. If an atom has six protons, it is carbon. If it has 92 protons, it is uranium. The number of neutrons in the nucleus of an element can be different, though. Carbon 12 is the commonest type of carbon. Carbon 12 has six protons (naturally, otherwise it wouldn't be carbon) and six neutrons. The mass of the electrons is negligible. Carbon 12 has a mass of twelve. Carbon 13 has six protons and seven neutrons. Carbon 14 has six protons and eight neutrons. Carbon 14 is radioactive because, as other atoms with the wrong percentage of neutrons to protons, it is unstable. The nucleus tends to pop apart. The proper ratio of protons to neutrons is about one to one for small elements and about one proton to one and a half neutrons for the larger elements. Types of an element in which every atom has the same number of protons and the same number of neutrons are called isotopes. Carbon 14 is a radioactive isotope of carbon. Any carbon 14 that was made at the time the earth was formed is now almost all gone. Carbon 14 is continuously made from high energy electromagnetic radiation hitting nitrogen atoms in the ozone layer of the earth. This carbon 14 when taken into plants as CO2 will also be taken into animals. We can find out how much carbon 14 that normally is in a living plant or animal and from there we can find the actual amount of carbon 14 left in a plant or animal long dead. We can get a very good idea of how long ago that plant or animal was living from the amount of carbon 14 remaining in the dead body. This process is called "carbon dating." The stable, non-radioactive isotopes of carbon play no part in this. As a whole element, carbon has a more or less fixed proportion of the various carbon isotopes. For this reason, we can determine a weighted average of the isotopes for all elements. On a periodic chart you may see some atomic weights that are integers or in parentheses. These are usually on the very large or very rare or very radioactive elements. That is not really an integer atomic weight, but the atomic weight has been estimated to the nearest integer. Now with the atomic weight information we can consider matching up atoms on a mass-to-mass basis. Let's take hydrogen chloride, HCl. One hydrogen atom is attached to one chlorine atom, but they have different masses. A hydrogen atom has a mass of 1.008 AMU and a chlorine atom has a mass of 35.453 AMU. Practically speaking, one AMU is far too small a mass for us to weigh in the lab. We could weigh 1.008 grams of hydrogen and 35.453 grams of chlorine, and they would match up exactly right. There would be the same number of hydrogen atoms as chlorine atoms. They could join together to make HCl with no hydrogen or chlorine left over. If we take one gram of a material for every AMU of mass in the atoms of just one of them, we will have a mol (or mole) of that material. One mol of any material, therefore, has the same number of particles of the material named, this number being Avogadro's number, 6.022 E 23. The formula weight is the most general term that includes atomic weight and molecular weight. In the case of the HCl, we can add the atomic weights of the elements in the compound and get a molecular weight. The molecular weight of HCl is 36.461 g/mol, the sum of the atomic weights of hydrogen and chlorine. The unit of molecular weight is grams per mol. The way to calculate the molecular weight of any formula is to add up the atomic weights of all the atoms in the formula. CuSO4 · 5H2O is the formula for copper II sulfate pentahydrate. The formula has one copper atom, one sulfur atom, nine oxygen atoms, and ten hydrogen atoms. To get the formula weight of this compound we would add up the atomic weights. Copper II sulfate pentahydrate is not a molecule, strictly speaking, but you will hear the term "molecular weight" used for it rather than the more proper "formula weight." Since the unit of formula weight is grams per mol, it makes good sense to use the formula weight of a material as a conversion factor between the mass of a material and the number of mols of the material. Protons have a positive charge and electrons have a negative charge. Free (unattached) uncharged atoms have the same number of electrons as protons to be electrically neutral. The protons are in the nucleus and do not change or vary except in some nuclear reactions. The electrons are in discrete pathways or shells around the nucleus. There is a ranking or hierarchy of the shells, usually with the shells further from the nucleus having a higher energy. As we consider the electron configuration of atoms, we will be describing the ground state position of the electrons. When electrons have higher energy, they may move up away from the nucleus into higher energy shells. A hydrogen atom has only one proton and one electron. The electron of a hydrogen atom travels around the proton nucleus in a shell of a spherical shape. The two electrons of helium, element number two, are in the same spherical shape around the nucleus. The first shell only has one subshell, and that subshell has only one orbital, or pathway for electrons. Each orbital has a place for two electrons. The spherical shape of the lone orbital in the first energy level has given it the name "s" orbital. Helium is the last element in the first period. Being an inert element, it indicates that that shell is full. Shell number one has only one s subshell and all s subshells have only one orbital. Each orbital only has room for two electrons. So the first shell, called the K shell, has only two electrons. Beginning with lithium, the electrons do not have room in the first shell or energy level. Lithium has two electrons in the first shell and one electron in the next shell. The first shell fills first and the others more or less in order as the element size increases up the Periodic Chart, but the sequence is not immediately obvious. The second energy level has room for eight electrons. The second energy level has not only an s orbital, but also a p subshell with three orbitals. The p subshell can contain six electrons. The p subshell has a shape of three dumbbells at ninety degrees to each other, each dumbbell shape being one orbital. With the s and p subshells the second shell, the L shell, can hold a total of eight electrons. You can see this on the periodic chart. Lithium has one electron in the outside shell, the L shell. Beryllium has two electrons in the outside shell. The s subshell fills first, so all other electrons adding to this shell go into the p subshell. Boron has three outside electrons, carbon has four, nitrogen has five, oxygen has six, and fluorine has seven. Neon has a full shell of eight electrons in the outside shell, the L shell, meaning the neon is an inert element, the end of the period. Beginning again at sodium with one electron in the outside shell, the M shell fills its s and p subshells with eight electrons. Argon, element eighteen, has two electrons in the K shell, eight in the L shell, and eight in the M shell. The fourth period begins again with potassium and calcium, but there is a difference here. After the addition of the 4s electrons and before the addition of the 4p electrons, the sequence goes back to the third energy level to insert electrons in a d shell. The shells or energy levels are numbered or lettered, beginning with K. So K is one, L is two, M is three, N is four, O is five, P is six, and Q is seven. As the s shells can only have two electrons and the p shells can only have six electrons, the d shells can have only ten electrons and the f shells can have only fourteen electrons. The sequence of addition of the electrons as the atomic number increases is as follows with the first number being the shell number, the s, p, d, or f being the type of subshell, and the last number being the number of electrons in the subshell. It is tempting to put an 8s2 at the end of the sequence, but we have no evidence of an R shell. One way to know this sequence is to memorize it. There is a bit of a pattern in it. The next way to know this sequence is to SEE IT ON THE PERIODIC CHART. As you go from hydrogen down the chart, the Groups 1 and 2 represent the filling of an s subshell. The filling of a p subshell is shown in Groups 3 through 8. The filling of a d subshell is represented by the transition elements (ten elements), and the filling of an fsubshell is shown in the lanthanide and actinide series (fourteen elements). Here is a copy of the periodic chart as you have usually seen it. And here is the same chart re-arranged with the Lanthanides and Actinides in their right place and Group I and II afterward. Both of these charts are color coded so that the elements with the 2s subshell on the outside (H and He) are turquoise. All other elements with an s subshell on the outside (Groups I and II) are outlined in blue. Lanthanides and actinides are in grey. Other transition elements are in yellow, and all of the elements that have a p subshell as the last one on the outside are in salmon color. You may be able to see it better with the subshell areas labeled. There are several other schemes to help you remember the sequence. The shape of the s subshells is spherical. The shape of the p subshells is the shape of three barbells at ninety degrees to each other. The shape of the d and f subshells is very complex. Electron configuration is the "shape" of the electrons around an atom, that is, which energy level (shell) and what kind of orbital it is in. The shells were historically named for the chemists who found and calculated the existence of the first (inner) shells. Their names began with "K" for the first shell, then "L," then "M," so subsequent energy levels were continued up the alphabet. The numbers one through seven have since been substituted for the letters. Notice that I have included an "R" shell (#8) that is purely fantasy but makes the chart symmetrical. The electron configuration is written out with the first (large) number as the shell number. The letter is the orbital type (either s, p, d, or f). The smaller superscript number is the number of electrons in that orbital. Use this scheme as follows. You first must know the orbitals. An s orbital only has 2 electrons. A p orbital has six electrons. A d orbital has 10 electrons. An f orbital has 14 electrons. You can tell what type of orbital it is by the number on the chart. The only exception to that is that "8" on the chart is "2" plus "6," that is, an s and a p orbital. The chart reads from left-to-right and then down to the next line, just as English writing. Any element with over 20 electrons in the electrically neutral unattached atom will have all the electrons in the first row on the chart. For instance, scandium, element #21, will have all the electrons in the first row and one from the second. The electron configuration of scandium is: 1s2 2s2 2p6 3s2 3p6 4s2 3d1 Notice that the 2s2 2p6 and 3s2 3p6 came from the eights on the chart (2+6). Notice that the other electron must be taken from the next spot on the chart and that the next spot is the first spot on the left in the next row. It is a 3d spot due to the "10" there and only one more electron is needed, hence 3d1. The totals on the right indicate using whole rows. If an element has an atomic number over thirty-eight, take all the first two rows and whatever more from the third row. Iodine is number fifty-three. For its electron configuration you would use all the electrons in the first two rows and fifteen more electrons. 1s2 2s2 2p6 3s2 3p6 4s2 3d10 4p6 5s2 from the first two rows and 4d10 5p5 from the third row. You can add up the totals for each shell at the bottom. Full shells would give you the totals on the bottom. We have included an R shell (#8) even though there is no such thing yet proven to exist. The chart appears more symmetrical with that shell included. The two electrons from the R shell are in parentheses. We have not yet even made elements that have electrons in the p subshell of the Q shell. "UND" is the undiscovered inert element that would be below radon on the periodic chart. These are more commonly known schemes. All you have to do is follow the arrows through the points to find the sequence. Add up the number of electrons as you go, and stop when you have equaled or almost exceeded the number. There have been a large number of variations on this idea, but they all work the same. Arrange the subshells in a slanted order and go through the array in straight lines, as in the first scheme, or arrange the subshells in a straight line and go through the array in slanted lines, as in the second scheme. In these schemes the inert elements appear after the first s subshell and after every p subshell. As the other type, this scheme type has its advantages and disadvantages, but they all lead to the same sequence. Any of these schemes, if used correctly, will give you the same thing, the sequence of the addition of the electrons to the shells. This pattern is correct for all of the elements that are not Transitional Elements or Lanthanides or Actinides. Of the Transitional Elements and Lanthanides and Actinides about one third of the elements do not follow the pattern. The Periodic Chart below is arranged sideways to show the electron configuration by shell. As you work with the schemes for finding the electron configuration of elements, you can check to see if your answer is correct by adding the electrons in each shell (downwards in the first scheme) and comparing with the Sideways Periodic Chart. The elements that do not fit the pattern have an asterisk by them. In the Transition Elements that do not follow the scheme, only the s subshell of the outer shell and the d subshell of the next to last shell have some trading between them. In the Lanthanide and Actinide series any trading of electrons are between the d subshell of the next to last shell and the f subshell of the second to last shell, the one filling as the elements progress up that series. The octet rule states that atoms are most stable when they have a full shell of electrons in the outside electron ring. The first shell has only two electrons in a single s subshell. Helium has a full shell, so it is stable, an inert element. Hydrogen, though, has only one electron. It can lose an electron to become H+, a hydrogen ion or it can gain an electron to become H-, a hydride ion. All the other shells have an s and a p subshell, giving them at least eight electrons on the outside. The s and p subshells often are the only valence electrons, thus the octet rule is named for the eight s and p electrons. On the Periodic Chart with shell totals you can easily see the octet rule. A valence is a likely charge on an element ion. All of the Group 1 elements have one electron in the outside shell and they all have a valence of plus one. Group 1 elements will lose one and only one electron, that single outside electron to become a single positive ion with a full electron shell of eight electrons (an octet) in the s and p subshells under it. Group 2 elements all have two electrons in the outer shell and all have a valence of plus two. Beryllium can be a bit different about this, but all other Group 2 elements can lose two electrons to become +2 ions. They do not lose only one electron, but two or none. The Transition Elements, Lanthanides, and Actinides are all metals. Many of them have varying valences because they can trade around electrons from the outer shell to the inner d or f subshells that are not filled. For this reason they sometimes appear to violate the electron addition scheme. Group 3 elements have a valence of plus three. Boron is a bit of an exception to this because it is so small it tends to bond covalently. Aluminum has a valence of +3, but some of the larger Group 3 elements have more than one valence. The smallest Group 4 elements, carbon and silicon, are non-metals because the four electrons are difficult to lose the entire four electrons in the outer shell. Small Group 4 elements tend to make only covalent bonds, sharing electrons. Larger Group 4 elements have more than one valence, usually including +4. Small Group 5 elements, nitrogen and phosphorus, are non-metals. They tend to either gain three electrons to make an octet or bond covalently. The larger Group 5 elements have more metallic character. Small Group 6 elements, oxygen and sulfur, tend to either gain two electrons or bond covalently. The larger Group 6 elements have more metallic character. Group 7 elements all have seven electrons in the outer shell and either gain one electron to become a -1 ion or they make one covalent bond. The Group 7 elements are diatomic gases due to the strong tendency to bond to each other with a covalent bond. All of the inert elements, the noble gases, have a full octet in the outside shell (or two in the first shell) and so do not naturally combine chemically with other elements. Examine the Sideways Periodic Chart With Electron Shell Numbers again. All of the Group I elements and hydrogen (the top row of the chart) have one and only one electron in the outside shell. That single electron is what gives these elements the distinctive character of the group. The Lewis structures are just an attempt to show these valence electrons in a graphic manner as they are used to combine with other elements. The element symbol is in the center and as many as four groups of two electrons are shown as dots above, below, to the right and left of the element symbol to show the valence electrons. All of the inert gases (noble gases) have all eight of the electrons around the element symbol, except for helium, which has only two electrons even with a full shell. Below is a demonstration of the noble gases written in Lewis structure. Notice the electrons are in red just to emphasize them. All the other elements have less than eight electrons in the outside shell. These electrons can be in the positions of the eight electrons of the noble gases, but there are some suggestions about where they belong. The Group I elements have only one electron in the outer shell, so it really does not matter where the electron dot is placed, over, under, right or left of the element symbol. Group II elements have two electrons. Some authors will place the two electron dots together on any side of the element symbol because the electrons really are in an s subshell together. Some authors will show the electrons separated from each other in any of the two positions with only one electron in each position. The reasoning behind that is that the electrons really do try to move as far away from each other as possible. Boron and the elements below it on the periodic table all have three electrons in the outside shell. These electrons may be grouped as each electron alone in one of the positions around the element symbol or as a group of two (s) electrons in one position and one electron in another. Boron is usually shown with separate electrons because it bonds mostly covalently. Covalent bonds, we know from the shape of molecules, tend to blend the s and p subshells into sp orbitals with one s and one p orbital blended, sp2 orbitals with one s and two p orbitals blended, or sp3 orbitals, using the single s orbital with all three p orbitals. The sp2 orbitals of boron tend to be flat trigonal shape, that is, the bonds are at 120 degrees from each other in a flat circle around the boron atom in the center. The Lewis structure of boron is any of the shapes below. Carbon and the elements below it have four electrons in the outer shell. Carbon and silicon are usually shown in Lewis structures to have four separated electrons, again because these elements bond purely with covalent bonds. The sp3 orbitals of carbon and silicon are tetrahedral in shape. Nitrogen and the elements below it have five electrons in the valence shell, so they must be shown with one pair (anywhere) and three solitary electrons. Oxygen and the elements below it have six valence electrons and so must have two pairs and two solitary electrons. Elements in the halogen group, Group VII, all have seven electrons in the outer shell, so only there are three groups of two and a single electron in the last position. The transition elements and the Lanthanide and Actinide series elements are not often used in the covalent bonds that the Lewis structures usually portray, but these metal elements can be portrayed in this manner using the number of electrons in the outer shell that corresponds with the valence of the element. There is a difference between the Lewis structure of a compound and the actual 3-D structure. The Lewis structure shows the elements as their symbols, and arranges the bonds (dashes) from each atom at ninety degrees from the symbol. The electrons not in bonds are shown as dots (here, squares) near the element. (See the first drawing.) The 3-D structure attempts to show the actual shape of the molecule. In the 3-D structure on the right. the electrons that are attached to the nitrogen atom are shown in red. The nitrogen atom is blue, and the hydrogen atoms are black. The bonds from the nitrogen to the hydrogens are also in black. The attempt has been to show the molecule in 3-D, so the bond in back seems to be going into the screen. Each bond has two electrons, so the electrons from all of the participants in this molecule are all accounted for. Question from Atomic Structure Bohr's model of atomic structure based on spectral emissions Can you help me with this atomic structure and periocity problem? Can you help me with this atomic structure problem?